Become an Expert at Color Mixing! There are a number of ways to mix colors. In your kit you will find 7 different colors; Red, Yellow, Blue, Black, Brown, Green and White. 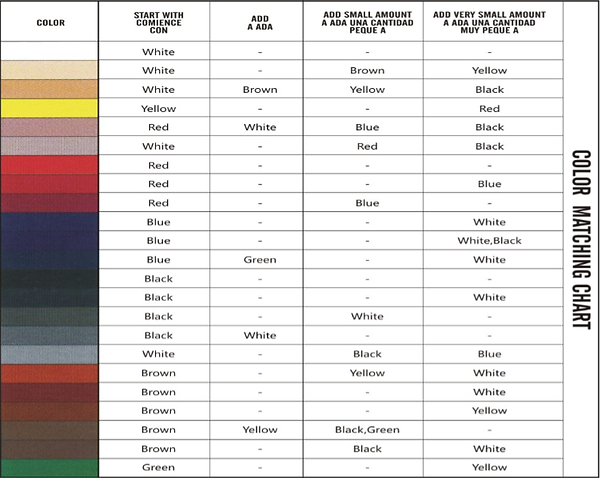 Below you will find our new color charts which have been designed by an artist with over 20 years experience painting and mixing colors. The charts have been specifically designed to make it easy for a beginner to follow! ​We have also included a measuring spoon in your kit so that you can get the correct measurements. ​Red, Yellow and Blue are primary colors and when mixed together in different amounts, they can allow you to acheive secondary colors and also get different shades of the color that you require. ​We recommend using the primary colors to obtain the correct color but you may also find that you can also acheive the right color by using the colors provided. For example, you can add black or white to the brown to acheive different shades of the color brown.